Have you ever taken part in a game jam weekend? I have! 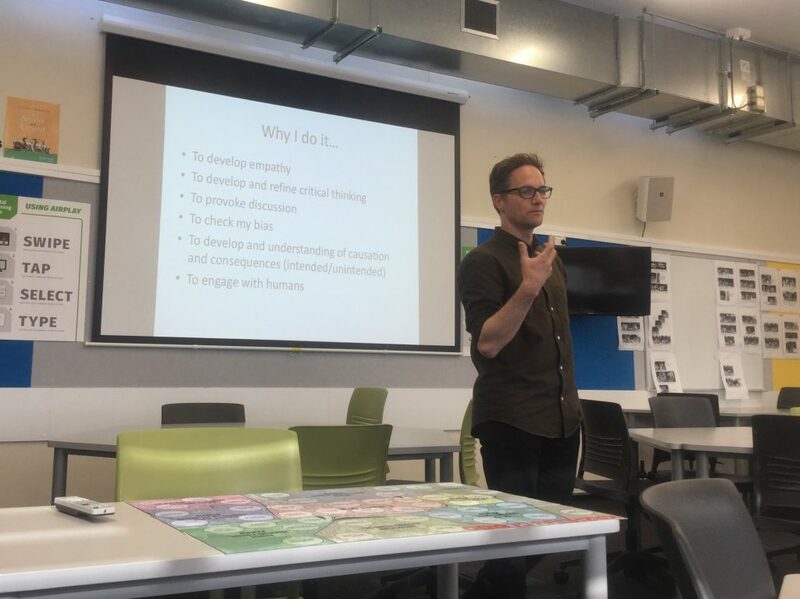 This past weekend marked the inaugural Game Jam for Learning, organised by Game designer/ Learning designer Richard Durham and hosted at the University of Auckland. 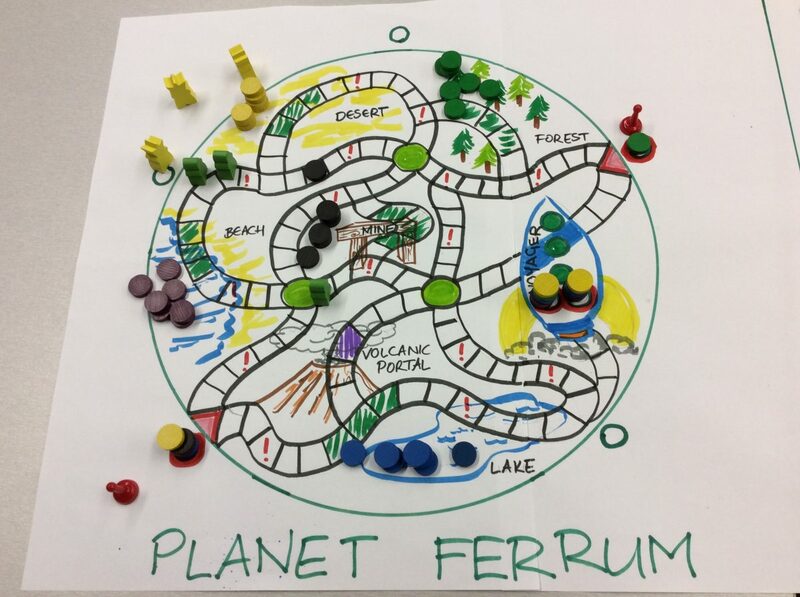 happened to be on the same weekend as the global game jam, but the Game Jam for Learning was a separate event designed for educators who wanted to try making a game for a specific educational purpose. So, did we succeed in making some cool learning games? Read on…. Friday afternoon kicked off with a welcome from our host Richard, and two inspiring talks. First, history teacher Andrew Savage, (whom you may recall from this post). talked about why he uses games in his teaching, and described some of the game experiences he curates for his students, using simple games like Jenga through to more complex Matrix Games. As usual, heaps of great stuff in Andrew’s talk about purpose as well as process, and some good discussion followed. Next, Toby Falconer, game designer and director of play at The Open Fort, got us started with some quick activities designed to help with “ideation”. My favourite activity was Gorilla Spurs, a technique for generating unlikely word pairings and then turning them into an idea for a product that we could pitch in 30 seconds. It was time to start thinking about our games, with sage advice from Richard: Don’t get too invested in your ideas since we you’ll likely throw most of them away after the first day! Day 2 (Saturday) – The designing begins! 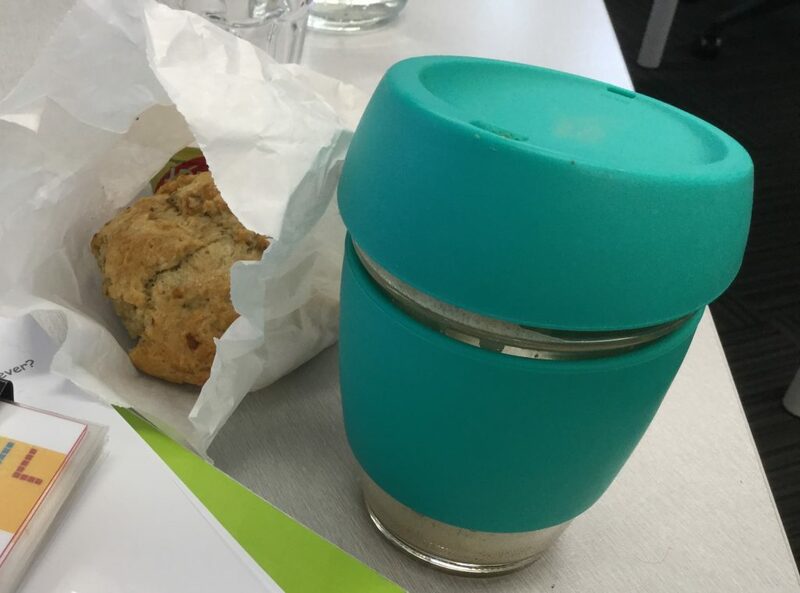 After fuelling up on the essential coffee and date scone, I was ready for our morning check-in. Most of the other jammers were teachers and had specific courses or classes they intended to design for – ranging from high school technology, to university courses in science education and business. 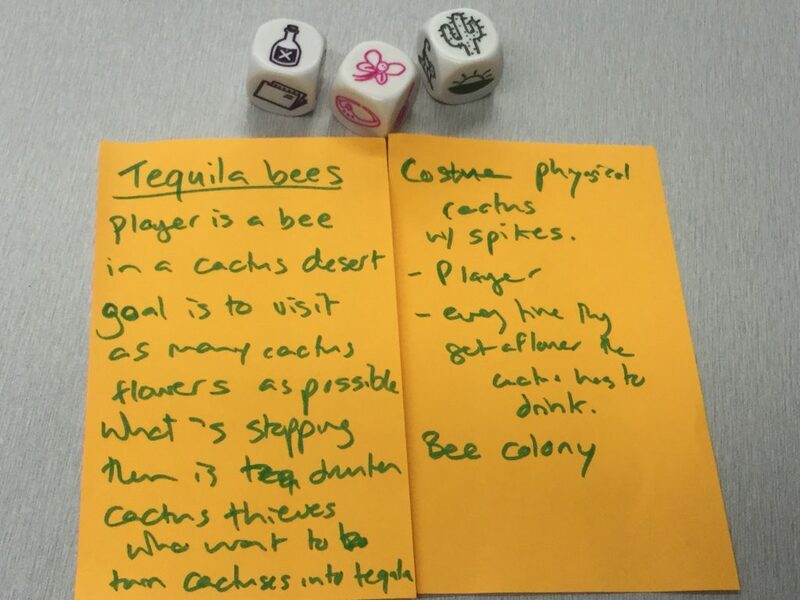 One jammer, an occupational therapist, was thinking of designing games to help the children she worked with to use their bodies in particular ways. I’d been weighing up what to do with my time, narrowing it down to two possibilities. Option one, I could use the weekend to hack my original game, Curriculum for the Future, and make it work better as a table top game. This option felt like “work”, and frankly after five years I’m a bit tired of thinking about that game. My second option was to use the weekend to make any game I wanted to make, just for fun. I decided to go with this option! I was still playing with the idea of a game where you experience the world through non-human senses. The tree theme reminded me of one of my favourite podcasts, Radiolab, specifically this episode about the mycelial (fungal) networks that connect with tree roots and enable all kinds of chemical communication between trees in a forest… what some researchers have playfully dubbed “the Wood Wide Web”. This appealed to my inner biological science nerd and my love of a good pun. 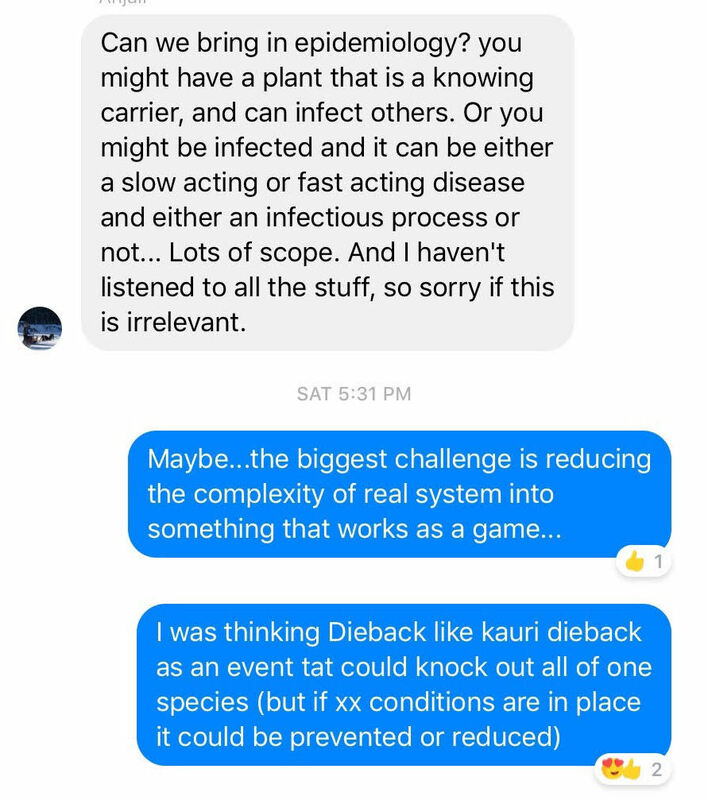 I quickly tested my initial game idea with some online friends who were, fortuitously, a mix of gamers and scientists. Everyone seemed excited! Saturday was a mix of designing time, and when our brains were hurting too much, time to play games. I found the game playing breaks to be super helpful and interesting. 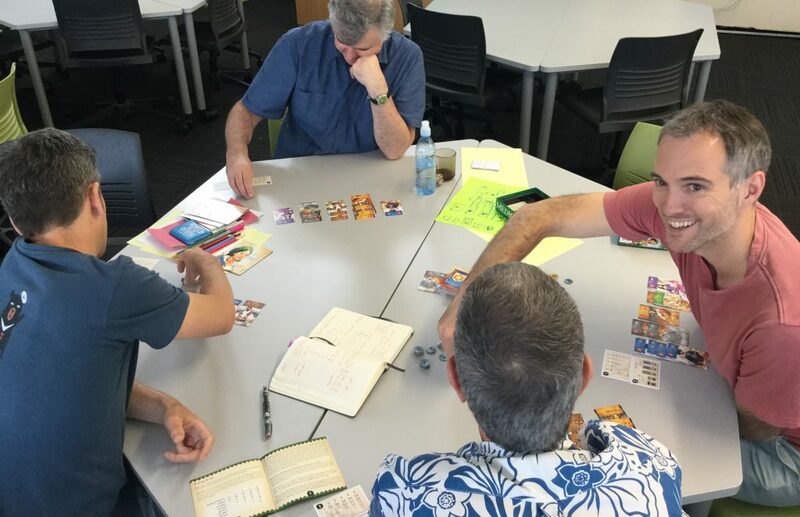 Not only did I learn some new games, it was also useful to notice and observe the different kinds of players we all were – all good stuff for the designing mind. I’ve come to realise I’m not cut out for very complex strategy games, nor games that take more than about 30-40 minutes to play, or instructions that require a lot of reading. Simple but elegant mechanics, puzzles, intriguing narratives and complex emotional engagements are my jam. Competition doesn’t motivate me much, but collaboration does. By Sunday morning I had the basic concept for my game in place, using prompts supplied by Richard: What is the main learning objective? What is the in-game objective? Who are they players? Why is reaching the game objective difficult? All that was left to do was design it! This is where it got hard. 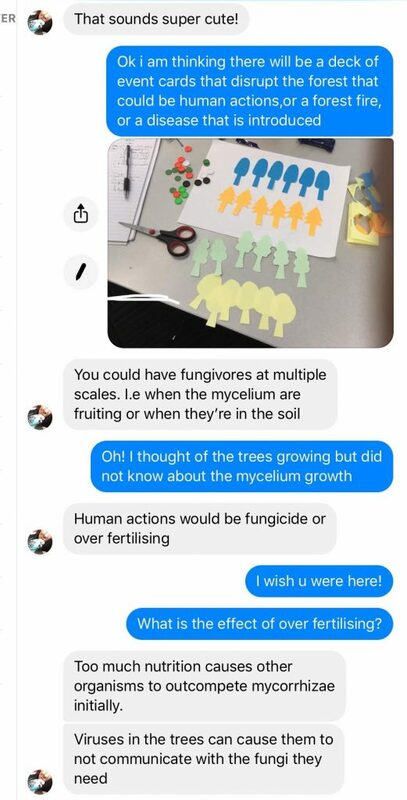 I put in some solid hours researching tree science, biochemistry, and tinkering with mechanics, but I also started to get bogged down in managing the complexities in the forest ecosystem my game hoped to model. Did I hit a wall? Yes I did, metaphorically of course. Did I feel like giving up? A little. Did I wander off to another room, find a couch, and take a power nap? You betcha. Returning to the jam, I played some more games and made a mental note that for my next game jam I am definitely going to work in a team, because game design is hard. 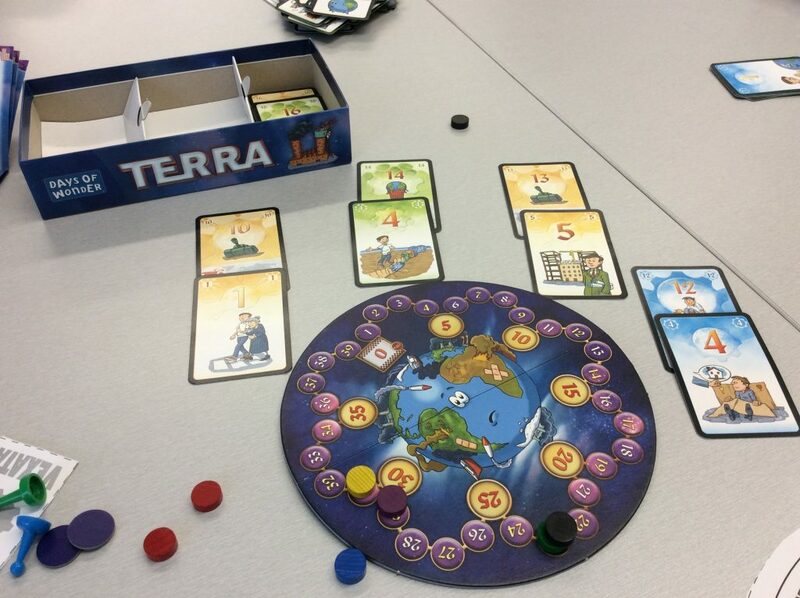 Terra – a Game about saving the world. I like this game A LOT! By the end of the day, we’d lost a few jammers, but the “stayers” were ready to showcase their games over some well-deserved pizza. We each test-played each other’s games, which was great! I was really impressed by the work the other jammers had done. 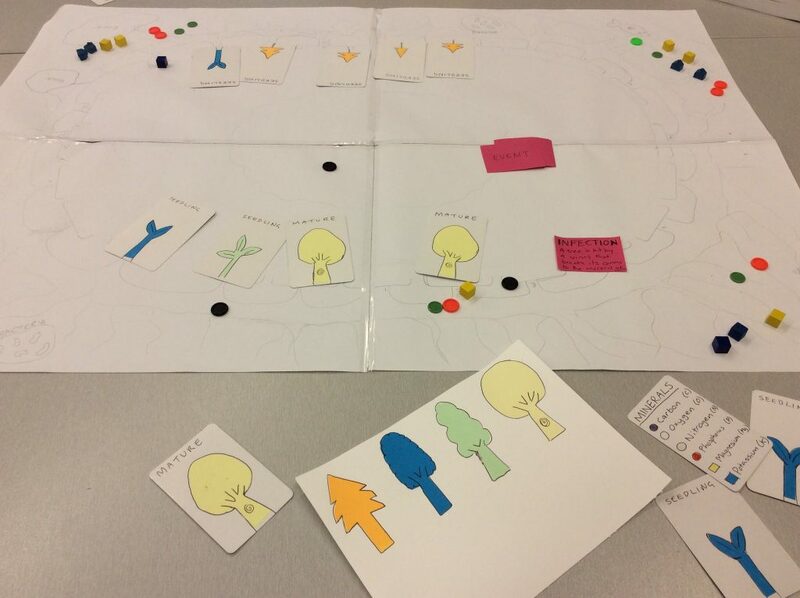 Their games ranged from a card game about science commercialisation, a physical “fishing” game designed for widely varying physical capabilities (SO fun to playtest), and science knowledge-building and nature-of-science game. I didn’t think I’d got very far with the Wood Wide Web game, but even having my jammer friends test-play it for one quasi-round and give feedback and suggestions was enormously helpful and very satisfying – because of course it was! 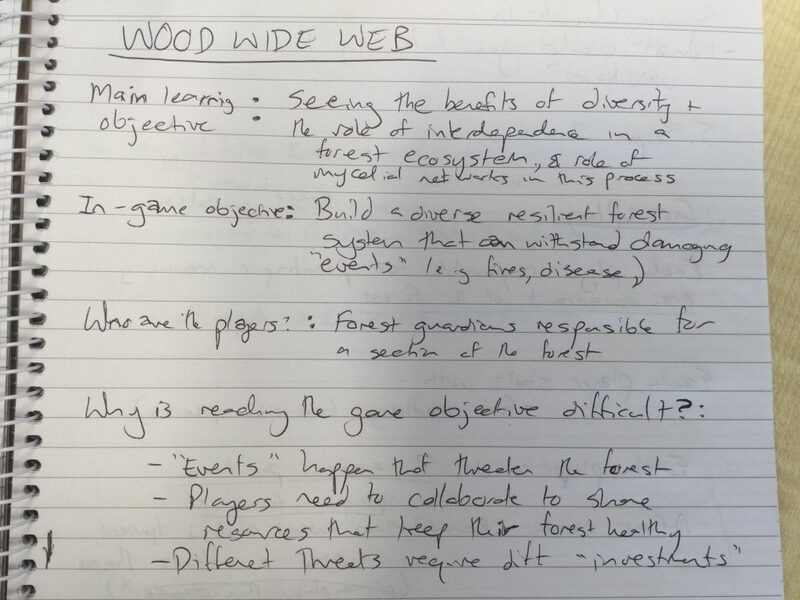 The Wood Wide Web game – still a work in progress! In spite of fatigue, we were still playing games when the security guard arrived to indicate that it was well past time to vacate the building. My game still needs HEAPS more iteration (psst, wanna hack it and help me make it better?) but even getting this far in a weekend felt like an accomplishment. Meeting and working alongside the other educators was great, and I was truly impressed with the effort and commitment they put in. It was hard work! Designing a game over a weekend is a tiring experience, but I really enjoyed it, and would definitely do it again. Next time I definitely want to work in a team. 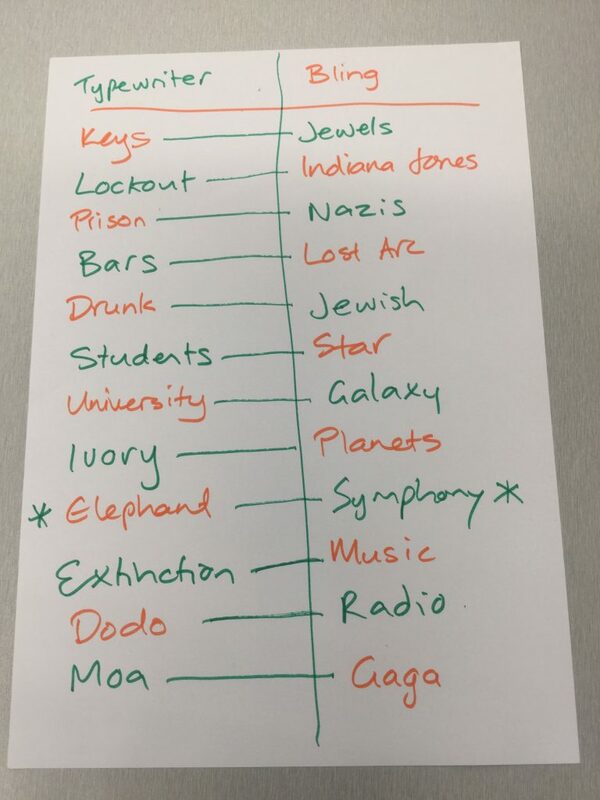 We need to get more educators and game designers involved in collaborative game jams! I’m grateful to Richard for organising the inaugural NZ Game Jam for Learning – let’s hope it’s the first of many! Do you want to be notified about future Game Jams for Learning, and hear about other resources, research, and meetups? We recommend you subscribe to NZCER’s Games for Learning mailing list and website.